Eight participants paid $1,000 each to spend five long days constructing the 12-ft.-by-14-ft. cabin. ORANGE, Va. (AP) — One gentleman came all the way from California. Another from North Carolina. A few others call various places in Virginia home. But all eight of them came to Orange County — James Madison's Montpelier to be exact — to build a log cabin pretty much the way they were built in Madison's day. A week later, the workshop participants have gained a new appreciation for the challenge faced by slaves and white settlers alike when it came to transforming a stand of trees into the place they would call home. The eight participants paid $1,000 each to spend five long days constructing the 12-ft.-by-14-ft. cabin. Most wanted to broaden their woodworking abilities, learn about the process from a historical point of view, or prepare to build a small cabin or shed on their own properties. “We had an hour-and-a-half session on nails, and it was fascinating,” said Clawson. So here's the deal: Every so often, Montpelier teams up with Craig Jacobs, who runs a business called Salvagewrights Ltd. in the town of Orange, to host a group of folks — men and women — interested in learning how to build a log cabin the old-fashioned way, maybe with a little help from chainsaws. Jacobs lives and breathes historic structures. He's called his home life “one step above camping.” His business is a clearinghouse of disassembled cabins and old houses, and all the parts — salvaged doors, building materials and hardware — that go into them. He is at his core a historic preservationist. His veteran crew, led by his son-in-law Stephen Nash, is about as skilled at this stuff as they come. Like the others that were constructed before it, the cabin built during the workshop is representative of those built by field slaves for their own housing. They typically had clay floors, simple wooden shutters for windows and clay-lined chimneys. Once the workshop was over, the new cabin was to be taken apart and reconstructed near others on the 2,650-acre Montpelier property, where archaeological excavations conducted in 2012 and 2013 found evidence of cabins that were built by slaves shortly before or after 1800. Workshop participants had the good fortune of having huge Virginia yellow pine trees felled and brought to the construction site for their use. On their first day, Oct. 30, they got busy debarking the logs. The largest ones, some up to a foot in diameter, were split, hewn to smooth the sides and notched so they would fit together. 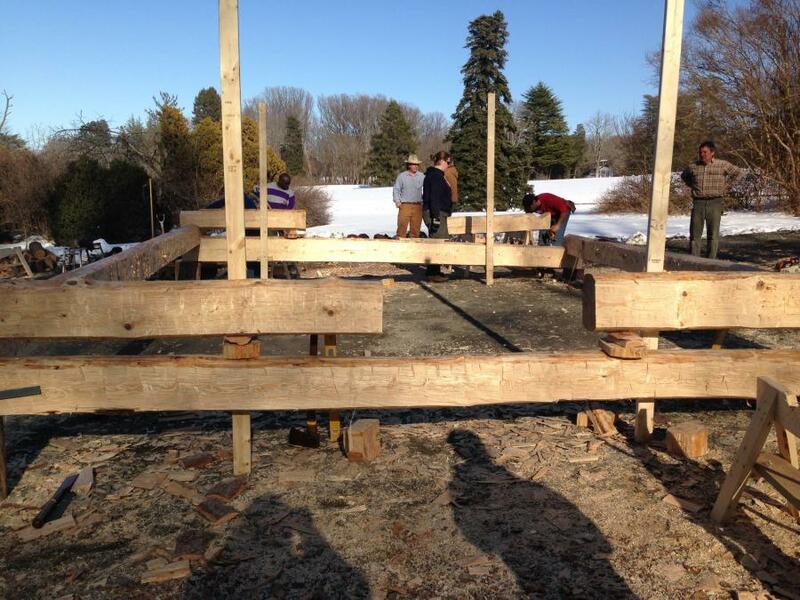 The group also learned how to frame rafters and joists. Jacobs has quite a few antique axes and other old hand tools the participants were taught to use. On Thursday, he demonstrated the proper way to sharpen them. Once the structure was complete, the group learned “chinking and daubing,” the process of using everything from stones and leftover wood scraps to mud and clay to fill the gaps between the logs, thereby protecting the interior from wind and rain. When these cabins are reconstructed at their permanent sites, they are left in their “ghosted” state, without the chinking and daubing. Clarence Grim, 79, a retired physician, made the trip to Montpelier from his home in South Lake Tahoe, Calif., to take part in the workshop. He had visited Montpelier before, became aware of the workshop and made plans to return. On day 4, Grim was crafting the pegs that would be used strengthen the joints. To do that, he used hand tools and something called a shaving horse. Grim used his foot to operate the Colonial-era contraption, which clamps down on a piece of wood and holds it in place while he tapers it into a peg. “I'll be coming back,” he promised, looking forward to a future workshop. All but one of this workshop's participants are retired, several of them from desk jobs that made this opportunity to use their hands to create something all the more appealing. George Blaine of Arlington retired after a career as a lawyer with a private firm and the government. His father was a machinist and millwright, and this was Blaine's chance to get some blue-collar experience. Bruce Hoover came from Rhoadesville, on the other side of the town of Orange about 10 miles away. He's a chimney contractor who also does some restoration work, so he had a basic idea of what the workshop was all about. He was aware of the program, but had previously been too busy to find the time to do it. Betsy Sweeney, a preservation technician at Montpelier, said the cabins are a natural extension of Montpelier's mission to present a fair portrayal of the slave community during Madison's time. One more cabin will now be added to help tell the story.